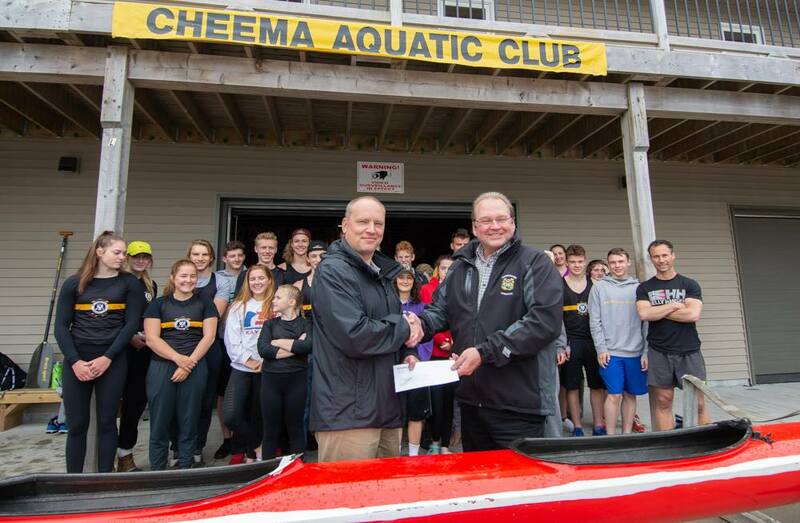 Councillor Steve Streatch visited Cheema on May 26th to present a $10,000 cheque from HRM. Councillor Streatch was able to see the impact of the donation first hand as our athletes showed off the "new to us" K4 purchased with the funds. One Nomination has been received for vacant position of Director at Large. This position will be voted on at the next board meeting on June 12th, at 7:30 at the club. All members are welcome to come to the voting portion of the meeting. Please see the attached nomination. We are holding an in-person registration this Saturday, May 26th from 9:30-11:30 at the club. If you haven't registered yet, or are interested but have some questions, come see us on Saturday. We will also have our canteen organizer available to take money for canteen tabs. With the completion of the Frank Garner Boat House project, it is now time to turn our thoughts to the future! We will be developing a new Strategic Plan that will guide us for the next three to five years. To do this, Cheema must fully understand the environment in which we operate and how to strengthen the organization to meet current and future challenges. We have engaged the services of Brenda Fair (Previous Cheema Commodore) of Fairwinds Training and Development to assist us in this strategic planning process. We would be very interested to hear your thoughts on the current and future direction for the club. Please click on the link which will take you to a brief online survey which kicks off the consultative process. All responses will be anonymous. The survey will only be live until May 7th, 2018. The feedback gathered here will be very valuable for us as we move forward, and we very much appreciate your time and consideration. Are you looking to be more active at the club? We have a board position open; the Director at Large position has become vacant. If you are interested in the position please contact Andrew Koch or Janie MacKinnon . They would be more than happy to tell you about the responsibilities of this postion. Cheema Aquatic Club is accepting applications for Summer Supervisor for the upcoming 2018 Summer Program. This position will run from May 21 to September 28. Please see the attachment for more details on the position. Applications will be accepted until 5:00 pm on April 20, 2018. No late applications will be considered. Cheema Aquatic Club is accepting applications for Coaching positions for the upcoming 2018 Summer Program. The program will run from Tuesday, July 3rd to Friday, August 24th (8 weeks). Salary will commensurate with experience. If this interests you, please forward a resume and cover letter to scottdsmith@eastlink.ca. Summer Registration is now open! Registration forms are available here, as well registration can be done online. We will be holding an in-person registration day on Saturday, March 10 from 1pm-3pm at the Fall River Fire Hall. Don't miss out, register early! Come join us on Monday, February 19th starting at 5pm at Finbar's (Bedford location). 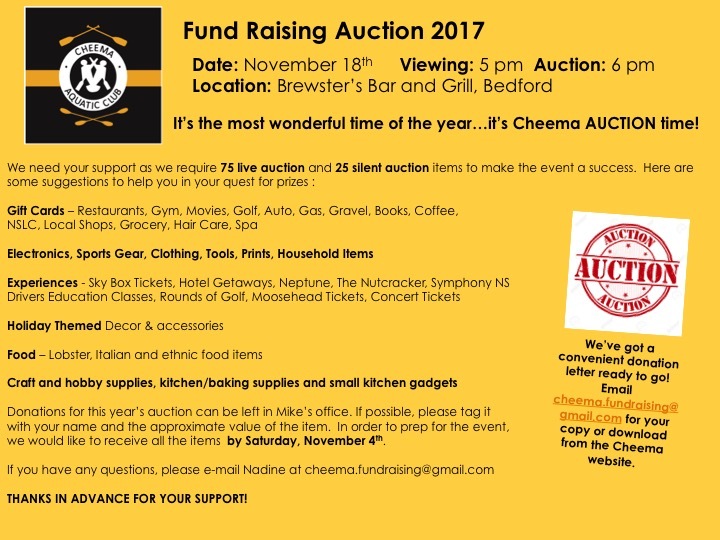 Finbar's will donate 15% of the evening's sales back to Cheema. Funds raised will go towards funding a NEW outboard motor for the safety boat. Spread the word and most importantly join us! 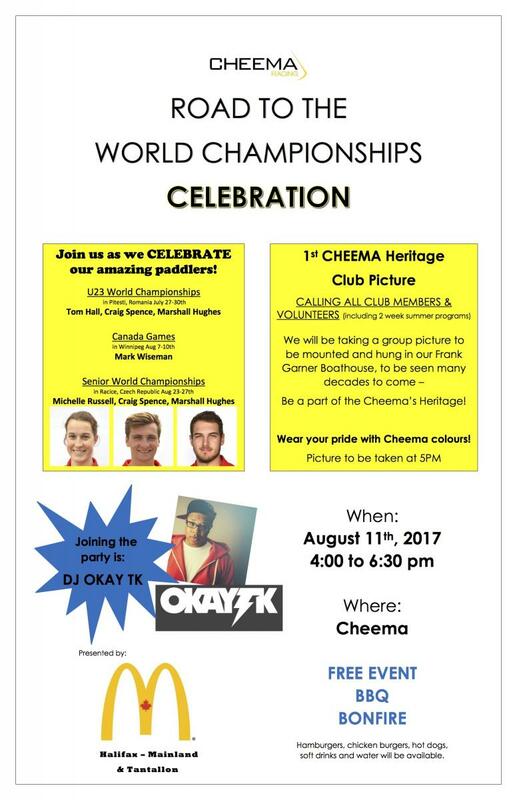 Cheema is looking for a Club Coordinator. The coordinator position is to provide consistent year-round organization and administrative support to the club. The position will have a strong focus on the preparation and implementation of the summer program, as well as the planning of various other competitive events, training events and training camps. The coordinator position will also serve as a contact point for members and the community. If you are interesting in applying for the position, please contact Angela Fitzgerald. Competition closes on January 31. Please see the attached for the full description of the position. There will be an order going in for Cheema clothing. Orders must be received by November 15th, no later, no exceptions. These orders will be guaranteed for Christmas delivery. It is our great pleasure to announce that the operating loan for the construction of the Frank Garner Boat House has been paid off in full!!! In 2011 the planning began, in 2013 the construction started and now in 2017 it has been paid for. Thank you to all sponsors, big and small, we thank you for your generous gift to Cheema! Please see the attached letter from the Frank Garner Boathouse Committee and the updated and expanded list of all campaign contributors. Our AGM will be held on October 24th at 7pm. Please see the attached documents that will be presented at the meeting. Nominations have been received for the 2017/2018 board. AGM will be held on October 24 at 7pm at the club. 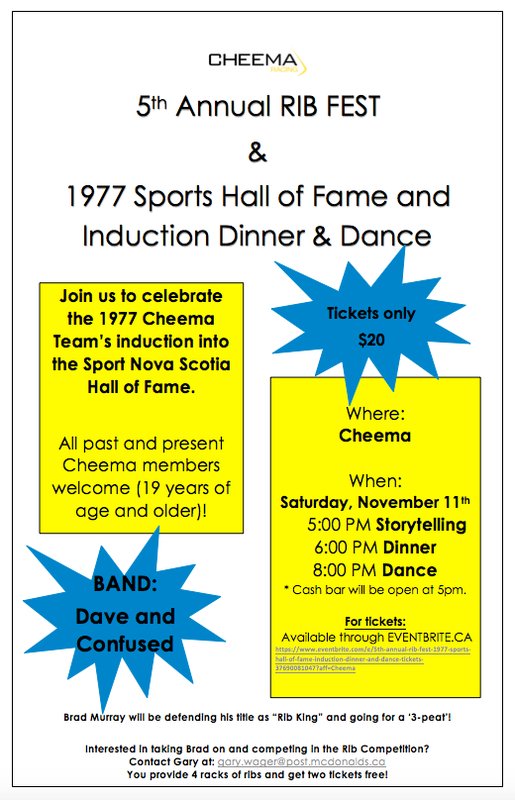 Cheema's Annual General Meeting will be held on October 24th, at 7pm, at the club. Elections will be held for all positions on the Board. Many of our board members will be resubmitting their names for their current positions, however we foresee vacancies in the following positions: Equipment Chair, Fundraising Chair, Summer Programming Chair, Facilities Chair and Vice Commodore. Please consider if you think you could fill one of those positions. In order to submit your nomination for a position, please complete the nomination form and have it endorsed by 2 supporters. Feel free to ask existing board members if you have any questions about duties and roles. We will be holding a special meeting prior to our regular board meeting on Tuesday, September 12 at 7pm. Please see the attached for the proposed by-law changes that will be discussed at the meeting. We are putting in a clothing order! Check out the attached files for the great items available! Order is going in July 5th. If you have any questions regarding the order please contact Deanna.